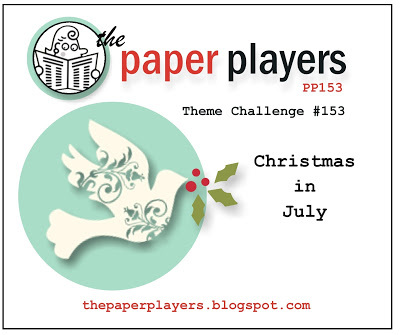 Is everyone ready for some Christmas in July? 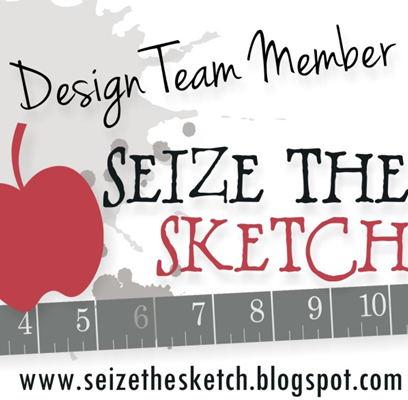 I hope so, because last week I received my Sneak Peek pre-order of Stampin' Up products from the new Holiday Catalog. 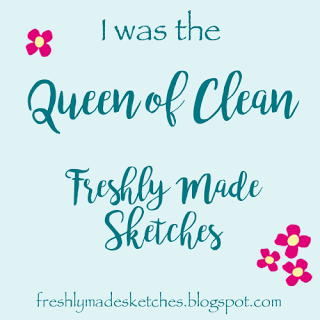 I have lots of fun new stuff to show you this week! 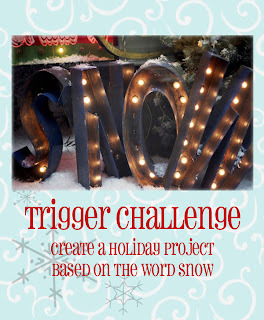 If you are not into red and green holiday projects, then the Winter Frost suite of products will be right up your alley. The Winter Frost DSP has beautiful shades of blue with some silver accents, and it looks great paired with the Special Season Stamp Set. 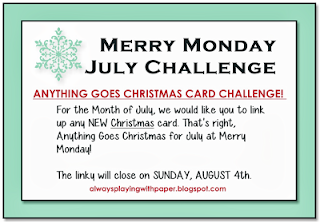 It's also Christmas in July at Merry Monday! 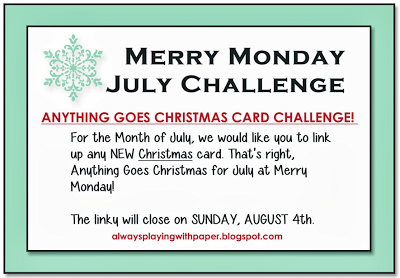 For the entire month of July, it's "Anything Goes" and we're invited to enter any Christmas card. I know I'll be playing along with this challenge more than once! And what do you know, it's Christmas in July at The Paper Players, too! How convenient that everyone has some early holiday spirit along with me! While I'm at it, I may as well play along with a challenge I'm checking out for the first time, Festive Friday. Theirs is a "Trigger Challenge", to create a holiday project based on the word "Snow". 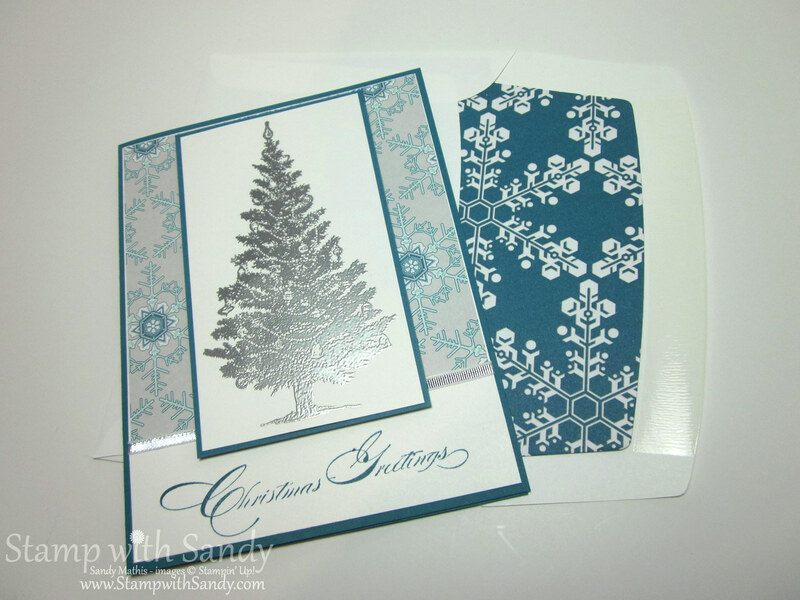 My snowflakes are in both of the patterns of DSP I used, for both the card and the envelope. I hope that will do! I didn't do anything fancy on the inside of my card but I wanted you to see the greeting. 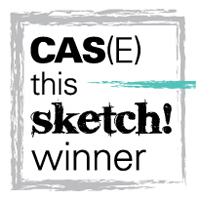 There's even a little image for the corner of your envelope. Love it! Last but not least are the awesome envelope liners. They were cut with the new Envelope Liner Framelits, one of the first items to go on my must-have list. From this angle, you can really see how shiny the silver embossing and ribbon are, too. 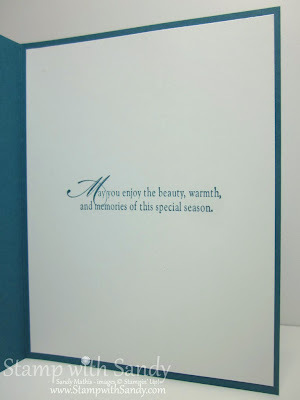 The new Stampin' Up Holiday Catalog will be released on August 1, but you can get a free copy from me now! Contact me here to request a copy. (No Stampin' Up Demonstrators, please). So gorgeous! I am afraid to leave the house today since my shipment is due to arrive :) I really love this new paper and set, you've showcased it so beautifully! Welcome to Festive Friday, Sandy...so happy you've joined us!!! 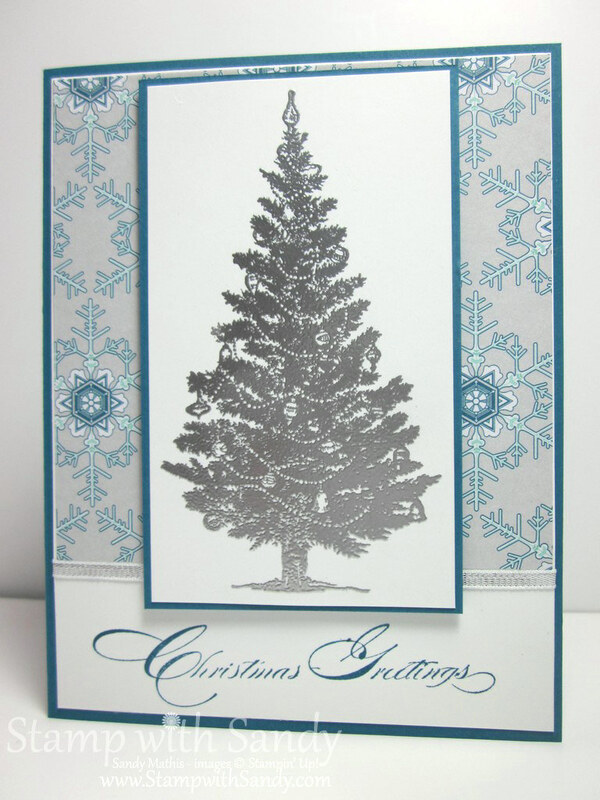 Your card is lovely, from the beautiful colors and delicate patterns, to the pretty tree image and that gorgeous sentiment...inside and out! The matching envelope is the icing on the cake!!! Thanks so much for joining us...hope to have you back again! I love this classic beauty!! I'm so glad to see what you've done with this set, Sandy! I was on the fence about it but I think it's definitely on my list now along with the paper! LOL, this post is costing me! Thanks so much for sharing this with us at Merry Monday! Very pretty card, I love the colours and papers you used. Thank you for joining us for Merry Monday. I am so glad you found us at Festive Friday! 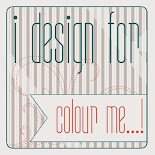 These colours are so soothing, and the image and sentiment are so elegant. What beautiful products, and what a gorgeous card! Thanks so much for playing with us this week, I hope we'll see you again! Love that paper! YUM! 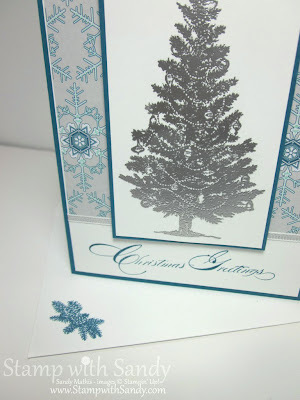 Stampin' Up does Christmas SO well and you have made their product shine here Sandy! Can't wait to see more Christmas goodies!! Thank you for sharing with us at Merry Monday! 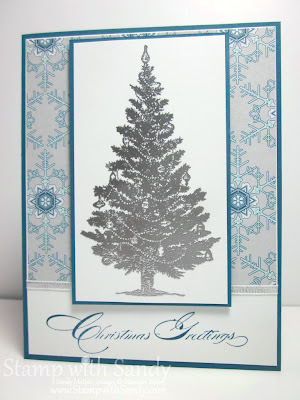 Beautiful classic and elegant card! Thanks for playing along with Festive Friday! Gorgeous! I love the envelope liner and the papers are beautiful. I just cannot make up my mind what to get from the mini...decisions, decisions! Thanks for sharing this with us this week at the Paper Players! This is gorgeous! I just love the new paper! !